Christmas dinner is for many the major food attraction of the entire holiday season. Every family has their own tradition -- some may prefer a day of finger foods and snacks, while others go all out and prepare a second Thanksgiving feast. The important thing is choosing a menu that is best for your family and your circumstances. We thought we'd each share some of what is traditional in our families. In my family (Heather), Christmas dinner is a big event. Its menu is planned for weeks ahead and thought is given to setting the table with festive tablecloth, napkins and a centerpiece. It is not set in stone what our menu will be. Creative reign is given to the host to decide if she would like to cook a turkey, ham, or some other form of meat. Why all the fuss? Our family loves sitting around the table sharing good food, enjoying lovely surroundings and one another's company. 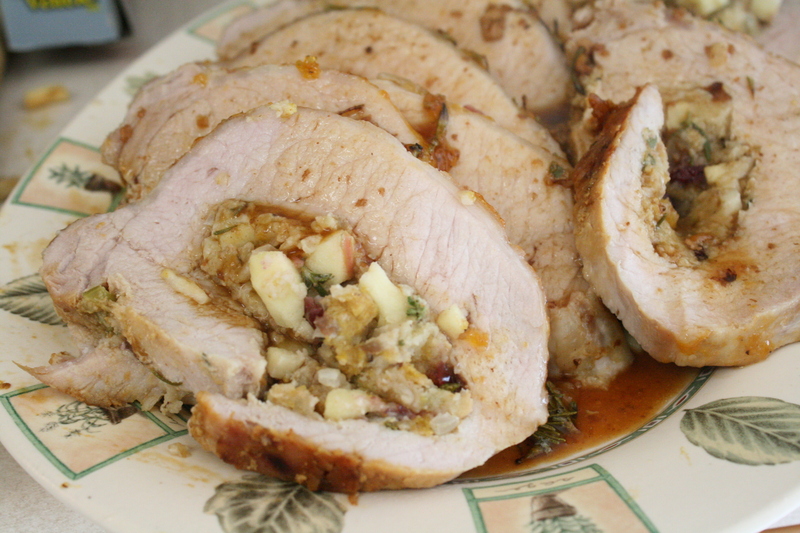 Last year I decided to make a stuffed pork loin for Christmas dinner. It was not difficult and provided a stunning centerpiece to the Christmas dinner. This year I'm thinking ham, accompanied by a potato/parsnip gratin (recipe yet to be created), spinach salad with grapefruit and maybe spiced pepitas, rolls, savory roasted sweet potatoes (if I have oven room), and chiffonade of Brussel sprouts. Dessert will be cookies, eggnog and Christmas pudding (a simple recipe will appear on Dec. 24). Melt butter in a saute pan and tip in onions and celery. Cook until onions are translucent. Add apple and cook until apple is beginning to go soft. Meanwhile, cube bread and place in a large bowl. 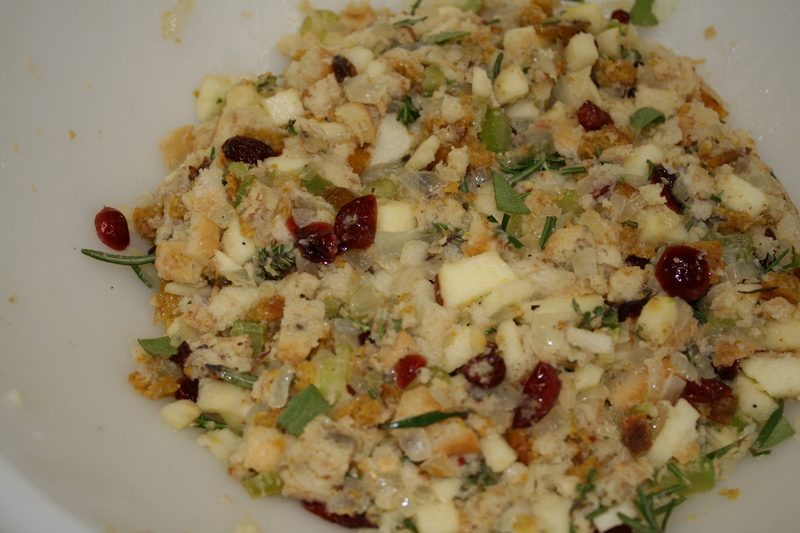 Add dried cranberries and chopped herbs. Mix in cooked apple and onion mixture and pour on enough broth to make the mixture come together. 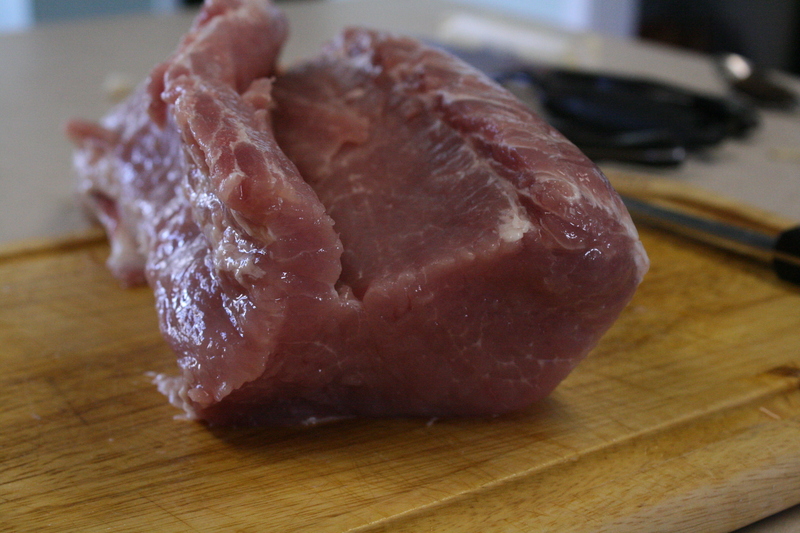 Lay the pork loin on a cutting board and carefully begin cutting the loin in a spiral so that it unfolds to be flat. 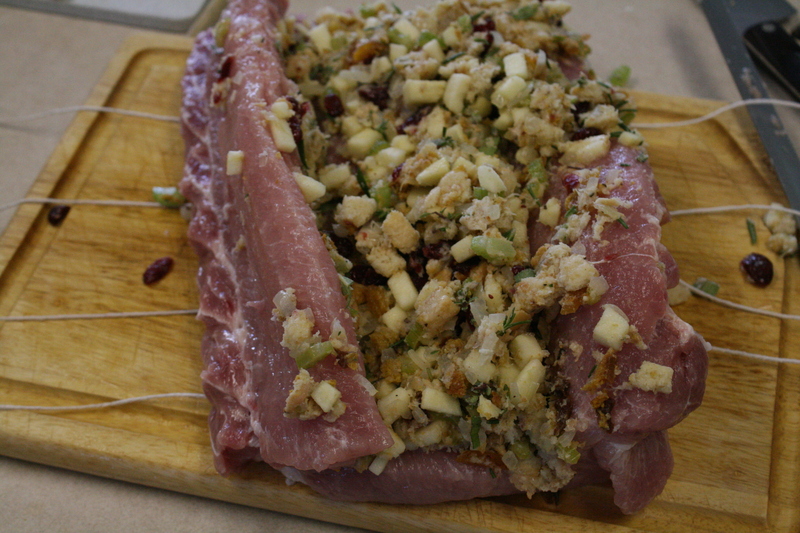 Place kitchen twine at intervals underneath the pork loin and carefully pat on the stuffing. 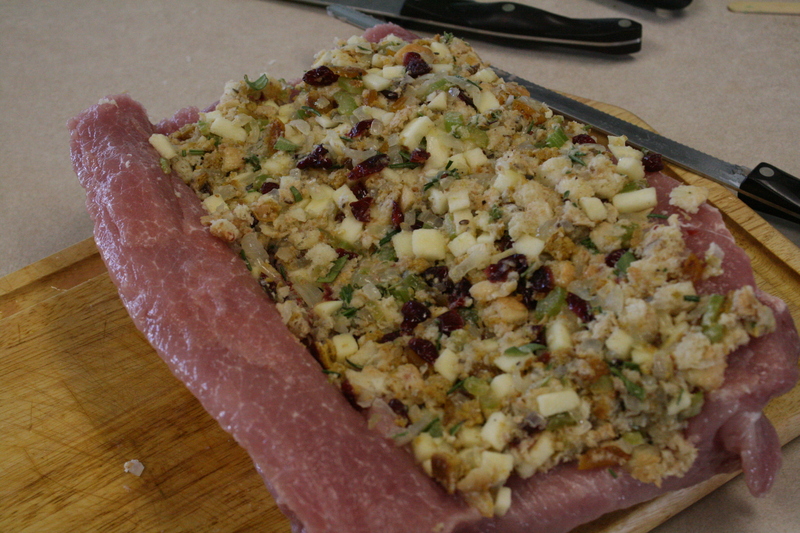 Roll the pork loin up slowly, stuffing bits of bread back in as it falls out. Enlist the help of someone close by to help tie the twine as tightly as possible. 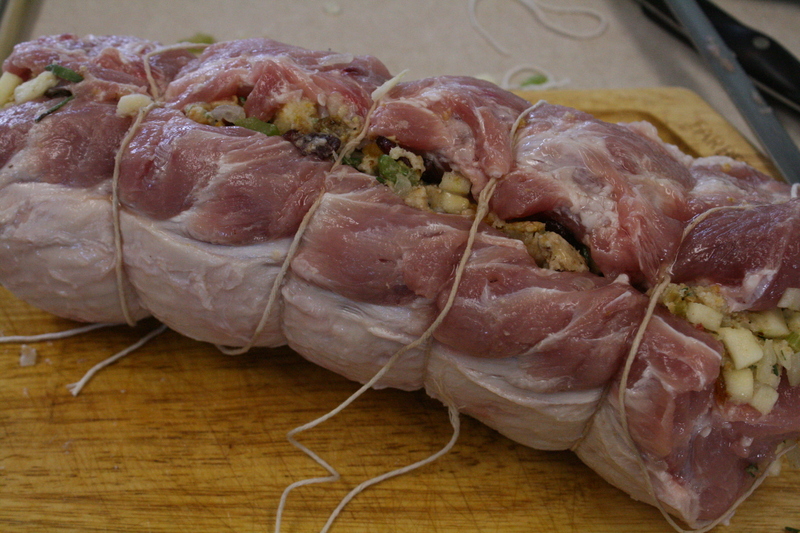 Place the pork loin in a roasting pan with the knots of the twine underneath. You can either cover and refrigerate up to one day, or bake the roast immediately. When ready to bake, preheat oven to 350F. 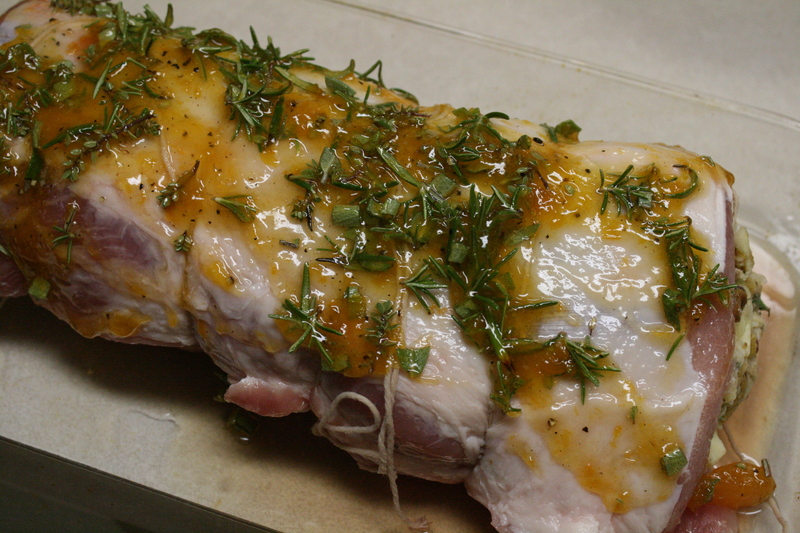 Spread apricot jam on top of the pork loin and sprinkle with chopped herbs. Roast uncovered in the 350F oven until instant read thermometer reads 160F (mine took about 2 hours). Remove the roast from the oven, transfer to a cutting board and cover with foil to keep warm while it rests. Meanwhile, mix the pan drippings with the port, chicken broth and apricot jam. Bring to a boil. Mix the cornstarch with 1/4 cup water and add to the gravy. Season with salt and pepper. Cook until thickened and keep warm until ready to serve. 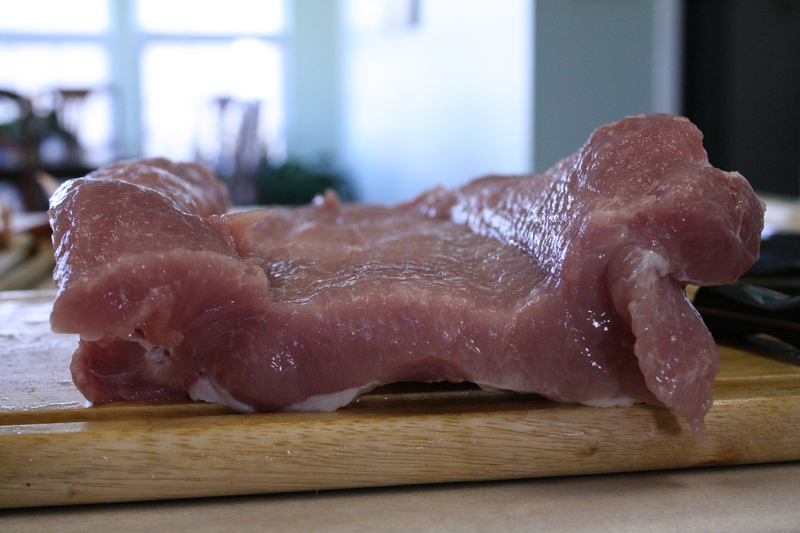 Slice the pork roast and lay on a platter, pouring the gravy over top or serving alongside. Christmas dinner for my family (Alaina) can be anything from lasagna or soup to ham or beef. 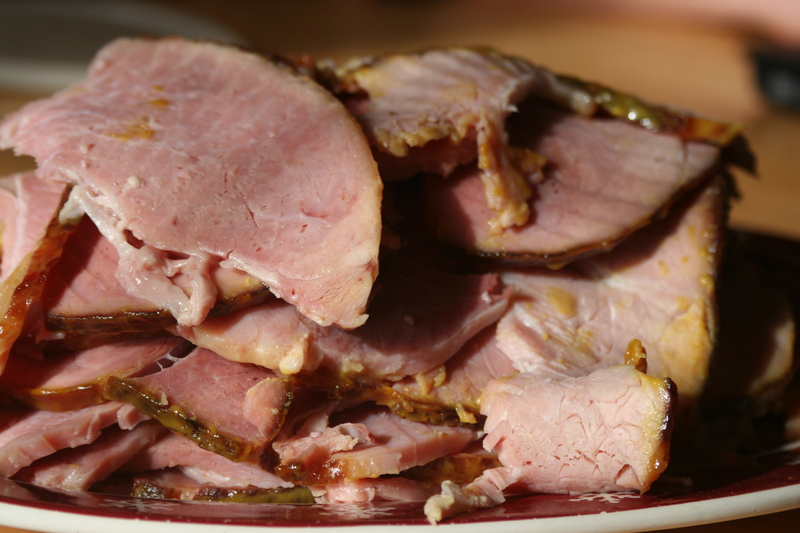 Traditionally, my grandparents have made ham and I'll admit that is probably my favorite. I like to buy the spiral cut, semi-boneless, half ham. It's usually fully cooked and I just heat it in the oven for a couple of hours depending on the size. Combine all ingredients in a small sauce pan and heat. Brush glaze over the entire ham about 30 minutes before it is finished in the oven. Carve & enjoy! Finding the perfect side dishes can be a challenge. Here are two side dishes that we really enjoy with ham! 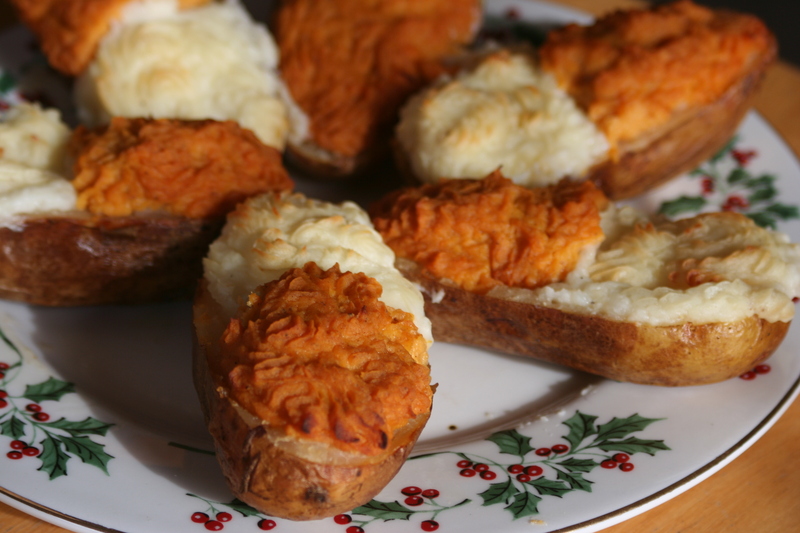 The first is a twice baked potato recipe that is a beautiful presentation and tastes so wonderful! Rub potatoes with oil and place in baking pan. Bake at 400 degrees for 1 hour or until tender. Cool completely. Cut in half lengthwise. Scoop out pulp leaving ¼ in. shell; set shells aside. In mixing bowl combine pulp, butter, sour cream, & milk; beat until creamy. Stir in salt, pepper, and 1 Tb. Chives. Spoon or pipe filling into half of each prepared shell. Bake or peel and boil sweet potatoes until tender. Put pulp in large bowl and add sour cream, butter, brown sugar, nutmeg, cinnamon, and salt. Whip until creamy and smooth. Pipe sweet potato in the other half of the prepared potato shells. 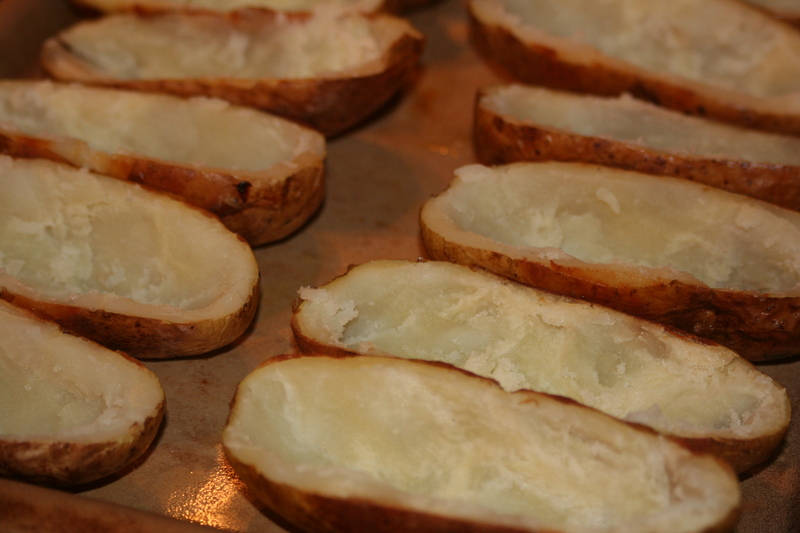 Return potatoes to baking pan – bake at 350 degrees for 35-40 minutes or until lightly browned. In a lg. bowl, whisk the flour, eggs, milk, butter, onion, Parmesan, garlic, salt and cayenne until combined. 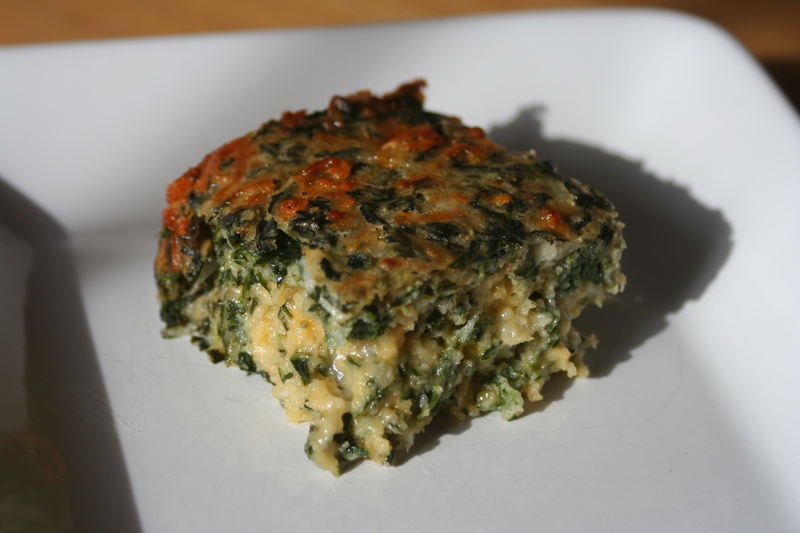 Fold in spinach and other cheese. Transfer to a greased 1 1/2 qt. dish. Bake, uncovered at 350 degrees for 40-45 minutes of until a knife inserted near the center comes out clean. Serve immediately. The final recipe is for an appetizer. I came up with this because it combined flavors that I love. 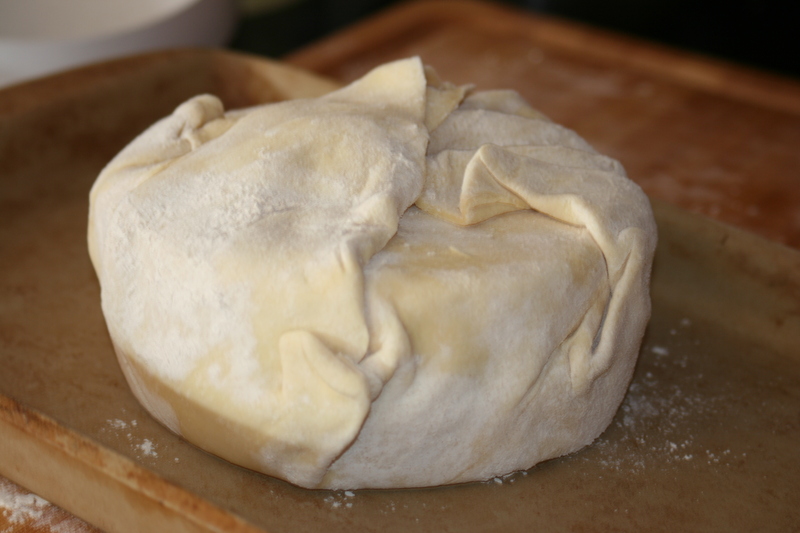 Roll out the puff pastry into a square (about 12x12 or a little smaller). Cut the wheel of brie horizontally. Place half of the brie rind side down on the puff pastry. 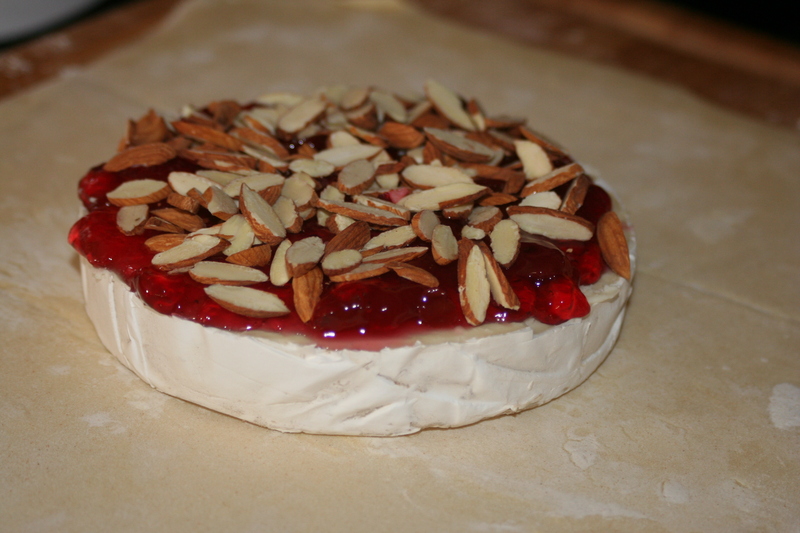 Top with cherry jam, sprinkle with the almonds. Place the other half of the brie on top (cut side down). Pull the puff pastry up around the brie. Brush the top with the beaten egg. 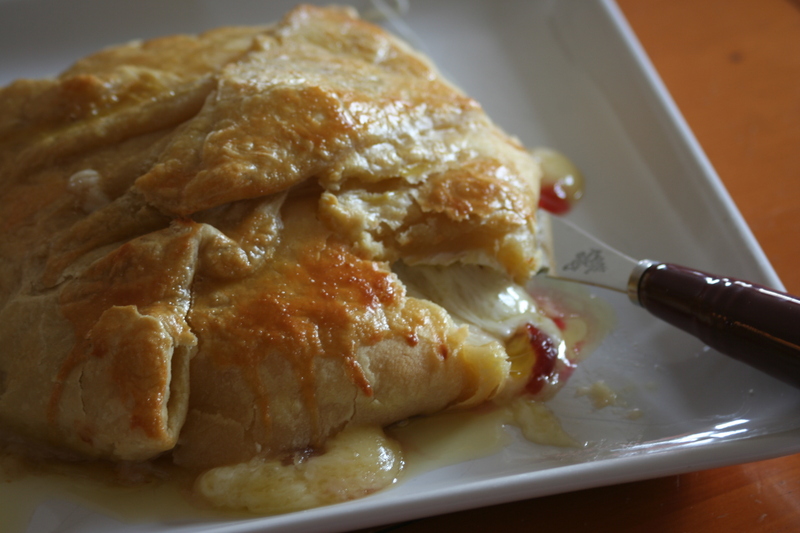 Bake at 400 degrees for about 20-30 minutes or until puff pastry is golden and cheese is soft. Serve with crackers. The pork roast looks delicious. What soup, salad, and desert would you serve with the pork roast? I like the idea of the potatoes and spinach dishes as sides.